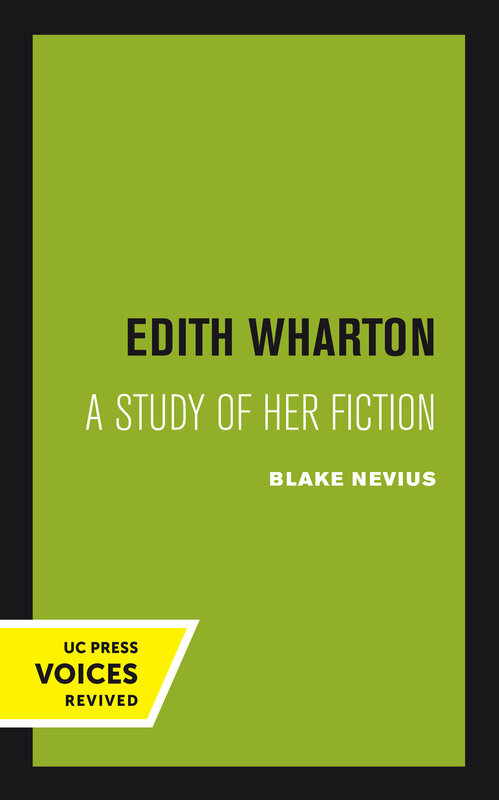 Blake Nevius’s close analysis and appraisal of Edith Wharton’s novels and stories reveals the modernity of her fiction and shows why she should have a permanent claim on our attention. Wharton is the only American novelist who has dealt successfully and at length with the remains of traditional New York society, which barely survived the beginning of the twentieth century. She illuminated, as no other novelist of her generation was able to do, a major aspect of U.S. social history through the dramatic conflict between the ideals of the old mercantile and the new industrial societies. Nevius also argues that Wharton, next to Henry James, is our most successful novelist of manners and, along with him, helped preserve the artistic dignity of the novel This title is part of UC Press's Voices Revived program, which commemorates University of California Press’s mission to seek out and cultivate the brightest minds and give them voice, reach, and impact. Drawing on a backlist dating to 1893, Voices Revived makes high-quality, peer-reviewed scholarship accessible once again using print-on-demand technology. This title was originally published in 1953. Blake Nevius was Professor of English at the University of California, Los Angeles.